Here at Bond Arms we really care what you think and we love to hear from you! Below are a bunch of recent testimonials from our customers. If you would like to share your story, we'd love to hear from you. Please click here to submit your testimonial. Thank you. Good Friday was great for me. In the morning I went to the gun shop and picked up the Texan I had ordered. Great looking gun. That afternoon I received the grips I had ordered. I put the small pearlite white grips on my Backup. Made it pop. Great Guns, Great Company. Thank you Bond Arms. I love shooting my Bond Arms Texas Defender. I have way to many pistols but this was my first derringer. I purchased a 3 1/2" Snake Slayer barrel too. The 3 " 410 rounds with 000 Buck shoots 5 nice size projectiles in a nice pattern. What a great self defense round. "One bullet 5 shots" and a loud BOOM did I say BOOM would likely send attackers fleeing. The one you hit aint getting up even if he was 250 LBS and high on PCP. Now that I have practiced with it a few times I feel real comfortable using it as a carry gun. 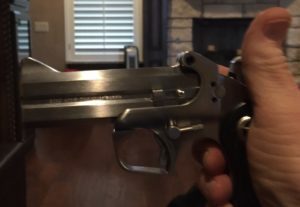 Now for my word of CAUTION for EXPERIENCED gun owners that haven't shot a derringer before. The Trigger is definitely an issue until you have practiced with it. I bought mine, read (not well enough I found out) the instructions, took it to the range (until I range test a new gun they stay in the box) and had a extremely hard time getting it to fire. I came home Googled Bond Arms Trigger and watched some videos and realized the part where it says "Pull down on trigger and back" was a big deal. Glad I tested it out before I needed it. I purchased my Cowboy Defender on sale at my local Academy; it came with the .22mag barrel set. I ordered the .22lr set to go with it, along with the .380 that was being sold at half price. I never could get either .22cal set to consistently fire. I contacted the manager at BA; they said that probably customers had been dry-firing the gun. I ended up making test shots, photographing them, then sending the pistol back to BA. Within a short time, I learned that they were replacing the entire pistol and both .22cal barrel sets under warranty. Additionally, because I'm left handed, when they built a new pistol for me they put the release on the 'right' side for me. I have purchased additional barrel sets along with the extended rubber grips; this gun is finished better than a lot of women's jewelry I've seen. I'm waiting, as are others, for that 6" barrel set for .410 to become available to add to my pistol. I've seen other, cheaper derringers at gun shows--none of them come close to the quality of this gun. And I'll bet they also won't match the high level of customer service. I'm sold! I bought a new Bond Arms .410/.45 in January. Tonight my son-in-law came in from work after dark and heard a noise, now known to be rattling going on the side of his house (next door to mine). 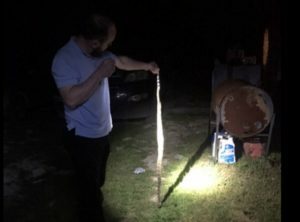 He thought he had a bad water leak but after walking up to the outside AC unit, he shined his cell phone light and saw the 4-4 1/2' Diamondback Rattlesnake behind his AC condenser. My daughter called and asked if we were tapping on her window and after walking outside, her husband was yelling for her to bring him his gun. I grabbed my Bond Arms which was already loaded with two 2 1/2" #6 lead shot and took it to him. One shot and one dead poisonous snake. The snake's neck and head were pouring blood. 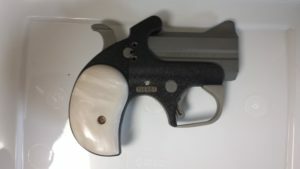 I told my wife that the Bonds handgun just paid for itself, because my young grandchildren play outside everyday and could have been bitten. The wife and I had been eyeballing the Bond Derringers for quite some time, and finally ordered ours about a month ago. I was torn between the 3 1/2 inch barrel on the C2K and the extended grips of the Papa Bear, but decided on the longer barrel for the 3 inch .410 capability. My wife was dead set on the Mama Bear. We picked up some ammo and took them out to get a feel for them. The 45/.410 is very manageable, even with 3 inch 000 buck, and surprisingly accurate. The Mama Bear was very snappy with the .357, but the .38 was a dream to shoot. Not sure if it's the ammo or the shorter barrel, but the .357 seemed to recoil much more than the .410. Afterwards we brought them home to clean, and saw that the lettering on one side of the grips on the Mama Bear was incomplete. Sent an email, and Liz sent us another set with no issue whatsoever. I would recommend these firearms to anyone, and I know my Bond is here to stay. Last fall I purchased a Texas Defender 38sp/357. Wow, what a gun. 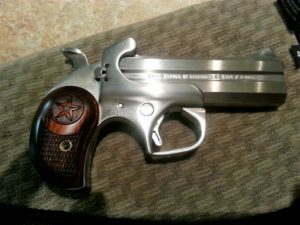 Handles great and packs a punch, particularly the .357. Then I found out about the promo from Bond Arms in November for 50% off extra barrel. I contacted them and said I bought mine in October, no problem, they sent me the coupon code for the barrel. So I ordered the Snake Slayer IV 45colt/410 4.25" Barrel. Definitely added some beef to the gun, but man is it fun to shoot. Now that packs some punch in 45colt. Local indoor range won't let me shoot 410 so I have to wait for a lil nicer weather at the outdoor range. You should see the looks from other shooters when I unpack the Bond. Everybody wants to know what it is and want to see it. Lots of fun and surprisingly easy to handle. Love it. Now I need a IWB holster. I bought my Bond Arms mini 45 because it used the same caliber ammo as my SAA Big Bore Bounty Hunter and my Henry Arms Mare's Leg. Once I shot this gun I knew I had made a GREAT decision. Since receiving my Mini 45 I have had my decision confirmed by multiple people. My son, former Marine, was totally against derringers because of previous encounters. Today, he shot the Bond Arms derringer and he was sold on them. He now wants one for himself. I love my Mini 45! Double Barrel Shotgun In Your Pocket! It was late, I was traveling and I needed fuel. I knew it wasn't the greatest area but it was well lit and there were several people around so stopped to fuel up. The next thing I know there were two unsavory fellows approaching me, they were focused on me. So I got my Bond Arms Snake Slayer IV out of my back pocket and at the ready behind my back. They came to me and demanded money so I presented them with another option (my .410 double barrel shotgun) and they decided to go elsewhere. I didn't have to fire it, just presenting it sent the snakes scurrying away. I really love my Bond Arms Derringer. I really need to get one of the driving holsters. But I have the .410/.45 barrel 4.5", and a 3.5" .44 Special barrel, and am awaiting a .38/.357 barrel. Bond Ranger II My Go To Gun! I am a retired law enforcement officer (44 yrs) and I use my Ranger II as my first go to gun! Yes I carry two guns all the time and I depend on my Ranger to eliminate the threat and if it doesn't I will go to my .380 Walther PPK-S. I believe the Ranger will get anyone's attention either with wounds or shock! In my career I have been a law enforcement trainer and armorer for almost every make of gun there is and most officers want something that carries 15rds. The Bond Ranger II in my opinion is the perfect carry gun. Just get past the derringer astigmatism and carry a real self defense tool! I bought the special issue Pike's Pike Model (a Defender, .45LC/.410, 2.5 in with .357/.38 3.0 in second barrel, included). My wife liked it, and said she'd rather have this one instead of her Ruger hammerless .357/.38. I got her the .22LR 3.0 in barrell for practicing and target shooting. 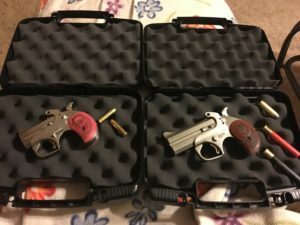 I bought myself a Texas Defender .45LC/.410 3 in and a 9mm 3.5 in and the .22 Magnum 3.0 in. I was smart enough to buy the barrels on sale over the Christmas holidays, in advance of buying my hand cannon. I will be taking advantage of the 50% off barrel deal, and after talking to Daryl, I am considering the .327 barrel. I picked up a few accessories as well...I love the quality of the Bond product line. Thanks Gordon, for a GREAT AMERICAN PRODUCT!